1.5 In this policy, “we”, “us” and “our” refer to Direct Waste Services. For more information about us, see Section 13. 3.6 We may process information that you post for publication on our website or through our services (“publication data“). The publication data may be processed for the purposes of enabling such publication and administering our website and services. The legal basis for this processing is consent OR [our legitimate interests, namely [the proper administration of our website and business OR the performance of a contract between you and us and/or taking steps, at your request, to enter into such a contract. 3.9 We may process information relating to transactions, including purchases of goods and services, that you enter into with us and/or through our website] (“transaction data“). The transaction data may include your contact details, your card details and the transaction details. The transaction data may be processed for the purpose of supplying the purchased goods and services and keeping proper records of those transactions. The legal basis for this processing is the performance of a contract between you and us and/or taking steps, at your request, to enter into such a contract and our legitimate interests, namely the proper administration of our website and business. 3.14 In addition to the specific purposes for which we may process your personal data set out in this Section 3, we may also process [any of your personal data] where such processing is necessary[ for compliance with a legal obligation to which we are subject, or in order to protect your vital interests or the vital interests of another natural person. (a) the period of retention of email, names, addresses and purchase historywill be determined based onfrequency of use and archiving for contact purposes. 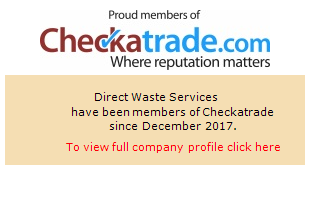 13.1 This website is owned and operated by Direct Waste Services. 13.2 Our principal place of business is at 41a, St. Lukes Rd, Tunbridge Wells, Kent, TN4 9JH.